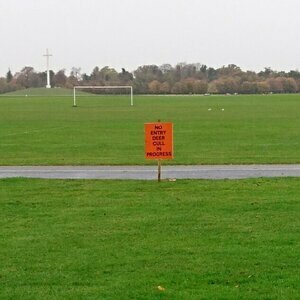 Beware of the snipers in the Phoenix Park. Jesus Christ Benton! Meanwhile, In The Phoenix Park Meanwhile, In The Phoenix Park Sure Where Would You Get It? Posted in Misc and tagged cull, deer at 9:37 am on November 9, 2016 by Broadsheet. Was that a message for the deer, or for the resident? Yes, well there have been reports of gangs of deer running around the Phoenix Park harassing the general public… y’know, smoking, loitering and shouting rude words at little old ladies and cyclists. It’s not their fault. The government won’t pay them not to do it. – Is that two little lambs or is it two balls? I’ve shared a similar view for a while, Sheik. Trouble is the farmers routinely poison rare birds of prey who will probably snap up a lamb per year. Imagine what would happen to the humble wooluf. Ha. So much for your left-wing ramblings. Is that like a booty cull? Your worry is well founded, Neilo. I recall hearing on the radio some months ago a Kerry headcase (who actually couldn’t stop laughing himself) insist that an urgent cull of the Red deer in the forest and mountain was required as they were coming down after the Heifers!! Any excuse, however fanciful, will do. On another note – Mmmmmmmm Venibeef! Sounds declicious.